High Prescription Wrapped Sunglasses have historically created a “Fishbowl Effect” that made it impossible for many people with higher prescriptions to get acclimated to these lenses. New Free-Form Digital lens technology allows us to put higher prescriptions in wrapped sunglasses without creating this peripheral distortion. Wrapped sunglasses with stronger prescriptions create a couple significant obstacles. Larger lens sizes will naturally create more lens thickness. 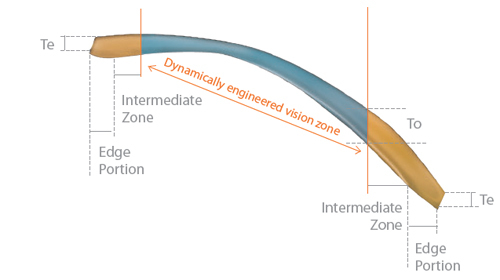 And since the power of a prescription lens is the difference between the front curve and back curve, starting with an 8-base curve on the front has always been considered a big handicap. ADS Sports Eyewear has come up with two high-tech solutions to these long standing obstacles. Free-Form Digital lenses were the first major improvement for higher prescription sunglasses. The entire back surface on these lenses is mapped to insure that every spot on the lens directs light to where it will be in focus. This minimizes the peripheral distortions in wrapped sunglasses with stronger prescriptions. Eliminating the fishbowl effect made prescriptions in wrapped sunglasses amazingly clear, but it did not make lenses any thinner. The most recent evolution of this digital technology now allows us to place the corrected portion of the lens right where the patient needs it the most. Since most people cannot see all the way to the outside edge of the lens this has been a non-issue. The field of vision is about the same as most standard eyeglasses, but the UV protection and the appearance is that of an 8-base pair of sports sunglasses. This new lens design is called a Lenticular Free-Form lens. "Lenticular Free-Form lenses can accommodate prescriptions between +6.00 and -10.00 on an 8-base wrap-style sports sunglasses. And this technology will make any prescription sports lens MUCH thinner." 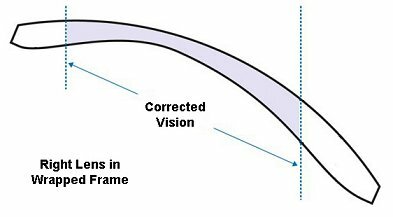 High index prescription lenses are often used to reduce lens thickness. But high index materials are breakable, so we rarely use them in sports sunglasses. Polycarbonate is the standard choice for unbreakable sports lenses. Trivex was developed by the US Military as an improvement over polycarbonate. Polycarbonate and Trivex are the only materials we will use in most prescription sports sunglasses, and absolutely the only material we will use in prescription motorcycle sunglasses. The new Free-Form Digital lenses generally work well in 8-base frames when a prescription is between +2.00 and -3.50. We routinely go beyond these limits, but these lenses become fairly thick outside these limits. One good option for people who want wrapped sunglasses without paying a premium for the Lenticular lens is select a flatter 6-base frame. The Oakley Gascan is the model we use most for high minus prescriptions because it is slightly flatter than an 8-base frame and it has wider temples that will hide the lens thickness. 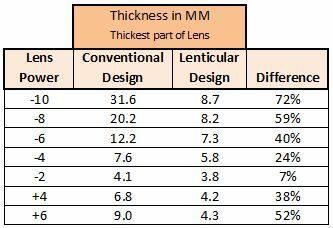 Click the chart to see how much thinner YOUR lens will be. Lenticular Free-Form lenses can accommodate prescriptions between +6.00 and -10.00 on an 8-base wrap-style sports sunglasses. And this technology will make any prescription sports lens MUCH thinner." It may be possible for you to see some of the uncorrected parts of the lens. Let us know if this is an issue. We can expand the usable portion of the lens, but the more we expand it the thicker the lens will be. The Return Policy for the Lenticular lenses is not quite as relaxed as the regular Free-Form lenses. Be sure to read this before ordering. Also read this page about Getting Acclimated to Prescription Sunglasses. We’ve had amazing success with this Lenticular design, and we consider this a substantial improvement for athletes with higher prescriptions. 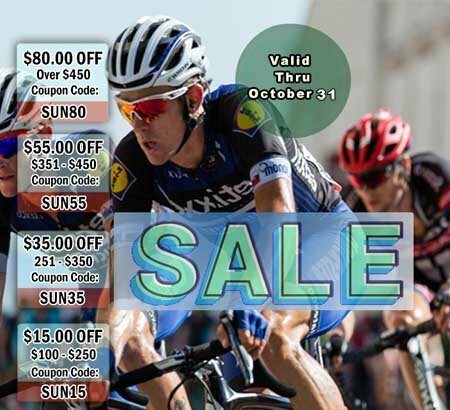 Prescription lenses in sports eyewear has always been our specialty. We consider Free-Form surfacing and this new Lenticular design to be the most important improvements of our lifetime. 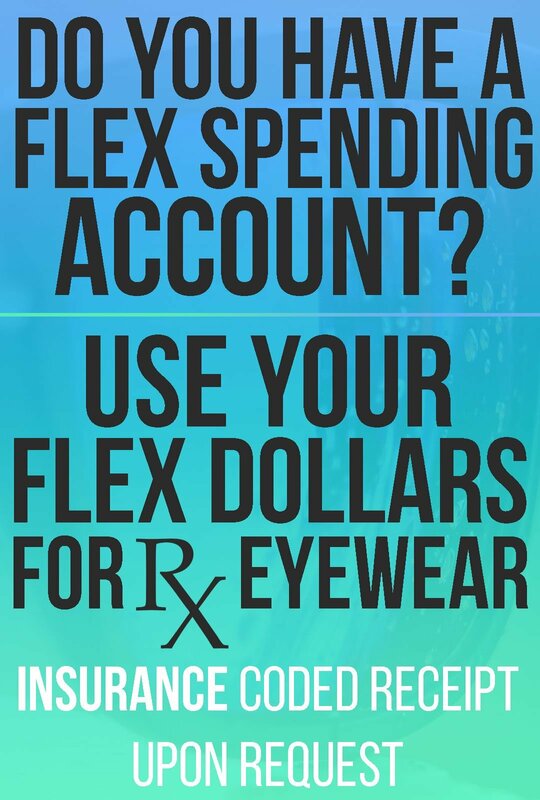 We guarantee that everything about your lenses will be exactly what you ordered, including the prescription power in every axis of the lenses. This is important, because these specialty lenses are NOT returnable. Specialty prescription lenses presented on this page require more expertise, more machinery, and more time to make than traditional lenses. These lenses will be tested to insure that they are within 1/100th of a diopter of the prescription that you provide. (Acceptable variance on a non-digital lens is 1/12th of a diopter.) If the lens you receive is exactly what you ordered there are no refunds. If the lens is not what you ordered we will remake the lens. If you have questions about polarization, flash coatings, AR Coatings, or any other Rx lens information we encourage you to ask us about it. We are always happy to help. These options cannot be added to, or removed from a lens once it is finished. If your doctor gave you the wrong prescription, or if you submitted inaccurate information online, you will be offered a 50% discount on the replacement lenses. If you have difficulty getting used to new eyewear when your prescription changes or when you get a new pair of glasses you may struggle to get acclimated to the change in base curve switching from flat everyday eyewear to curved sports eyewear. If you decide not to invest the time required to get acclimated to a change in your glasses you are considered a non-adapt. In the absence of anything abnormal, everyone can eventually get acclimated to a change in base curve. The average amount of time for this acclimation process is between 15 minutes and a couple days. A few people take much longer. This page about Getting Acclimated to New Glasses has more information about this. If needed, we will help you work through this acclimation process. If you are a complete non-adapt you can return the frame and lens in new condition to receive a 50% refund of your purchase price, or we will remake the lenses in a flatter frame at no charge. If the replacement frame is more expensive than the original frame you will be charged the difference. If you have any questions at all about this return policy, please call us at (800) 381-9083. Click Here to Buy Lenticular Prescription Lenses Now!